Beautiful and soft country look bedding. Love it! The EcoPure Organic Meadow Walk Comforter Set is made for those who care about their impact on the planet, and also want a touch of style for their bedroom. 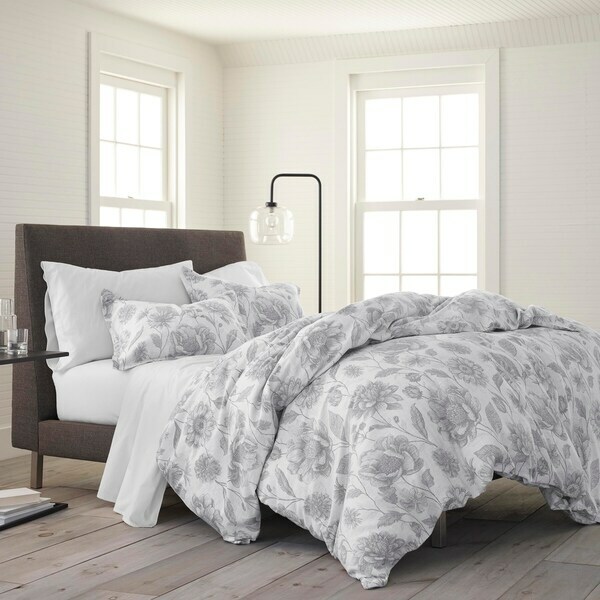 Patterned with a serene Gray floral design over a natural linen colored background, the set is made using chunky 100 Percent GOTS certified organic cotton slub, and non-harmful, Oeko-Tex approved dyes & finishes. Garment washed for softness, the set has is light-weight for a comfy night's sleep. The comforter is filled with EcoPure dreamsoft 95 percent recycled polyester and 5 percent virgin, so you can be sure it's eco-friendly. The sham(s) are edged with a 1 inch stitched self-flange, and have a 6 inch center back fabric overlap closure. The set is available in Twin, Full/Queen, and King Sizes. The Twin Set comes with one Standard sham, The Full/Queen Size comes with two Standard shams, and the King size comes with two King shams. *EcoPure™ fill is a soft & squeezable poly fill that reduces the footprint on our Earth's natural resources by using recycled plastics in its construction. EcoPure™ Eco-Friendly Fiber starts with recycled plastic bottles that are carefully combined under high temperatures to create the super-soft fiber. This hypo-allergenic fill gives added support and softness to the EcoPure™ collection. Dimensions 96.0 In. X 110.0 In. X 1.0 In.